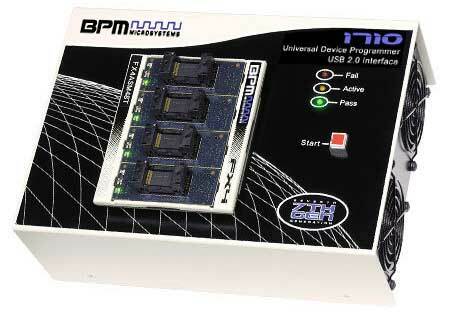 The 1710 manual universal device programmer is manufactured for design engineering and low volume production. It has the versatility to program memories, microcontrollers, E/EPROMs, FPGAs, PLDs and more with any manual or automated socket module, including standard, high-speed FX™, and FX4™ socket modules. FX4™ socket modules are designed specifically for the 7th Generation series of programmers and have the capability of programming four devices simultaneously, enabling users to achieve greater productivity. With existing support for tens of thousands of devices and support for new devices added each day, the 1710 is certain to meet your device programming needs.